be? Any input would be cool thanks. Check it’s not something stupid like a broken wire right at the connector. I had a Mazda 3 throw a MAF error and would only run on the limp map. While in the process of swapping the MAF with a junkyard one, I saw that was the issue. Hi blackmx6 no that not anything similar to mine, money is exactly how I described it but thank you. Hi onewingangel I have wiggled all the wires with the engine running hooked up not hooked besides actually cutting the rubber boot around the connector to check the wires I have inspected. It's very weird how it happened in an instant, the car was just running perfect drove 50 miles parked it, went inside 40 mins came outside problems. Makes no sense. I will continue to try an diagnose thanks for the help. 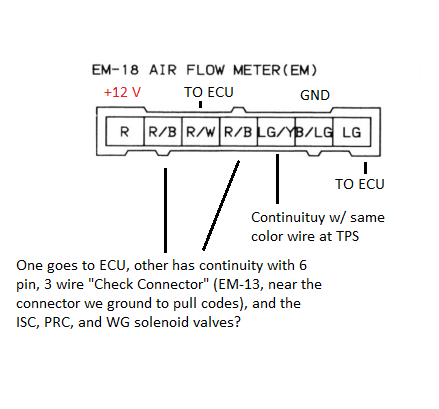 If the engine is running is there a certain ohms the would read at the factory connector to see possibly if theres something wrong in the wiring? No problem man, what state are you from? Anything wet under the hood? Just a thought because once I had a similar problem, ended up being my igniter connector having a bit of water due to rain. After looking at the wiring diagram this is my best guess as to the pinout of the VAF connector, but I could be way off in the rhubarb with this. Hi blackmx6 I'm located in Wa state about 2 hrs north of seattle. Nope no water was a beautiful day. What the device that's mounted to the back of the throttle body) it would send fuel as long as I would tap for, now this is super weird to me. So theres 3 connectors mounted at the base of the throttle body, the red an black wire with white wire connector I unplugged an the buzzing stopped, starts when plugged in, so could the unit or sensor just have fizzled out an that's the issue? Makes me wanna Change that thing out, I have a spare. Any was though that was interesting whata yall think? Just went an checked when the key is turned on an you plugged back in the maf the buzzing noise goes away an is a faint humming noise but you tap anywhere on the intake manifold or that unit that's mounted on the firewall side an it ls sending fuel to my fpr, like almost 40 psi just a small bursts. Wierd.